Off-season on the island of Abaco in the Bahamas is profoundly and refreshingly quiet. For a city-dwelling New Yorker like me, the silence was almost ghostly, but completely rejuvenating. On Abaco, you share the roads with large land crabs instead of taxis, and on a typical outing are likely to encounter more butterflies than people. 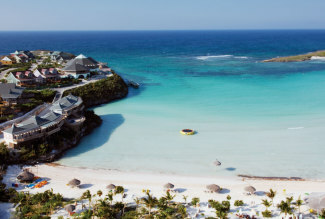 In July, my family and I made the journey - a flight to Nassau, a puddle-jumper to the island and a 45-minute scenic drive - to the Abaco Club on the southeast edge of this exquisite island deep in the Atlantic. At the airport, we were welcomed by Beed, the Abaco Club's airport greeter, who helped us pick up our rental car and pointed us to Snappa's, a dockside bar in Marsh Harbour, where we could grab a bite before driving to the Club. There was no waiting at Snappa's, or anywhere on Abaco, in the off-season. We enjoyed rare sushi-grade tuna, Philly chicken sandwiches and plenty of Kalik, the tasty local beer. Relaxing in the open air with a slight early evening breeze and a view of the yachts and fishing boats in the harbor gave us renewed energy for our lovely 45-minute journey to the Club. The Abaco Club is tucked away on 534 acres at one end of the island, a beautiful property even at night. Upon arriving, we picked up our golf cart-only golf carts are allowed on the Club's grounds-and cruised up the hill to Cottage 42. Ultimate Escapes has six homes at the Abaco Club, each more exquisite than the next. A golf cart comes with each residence, which is an easy 5-minute drive from the creamy white, heart-shaped beach. On our first morning at the Club, we stepped out onto the deck to see the sun glinting off the deep blue Atlantic Ocean. We ate toasted bagels and cream cheese and a fruit and cheese amenity plate provided by the Club while we made our plans for the day. We spent some time exploring the resort, including a memorable stop at the Abaco Clubhouse to meet Archie, the Club's "mixologist." He is famous for two things: his "Winding Way Wind-Up"-a delicious blend of rums, apricot brandy and various juices-and his droll comments. The next day we played golf-18 holes in three hours-with nary a soul on the course. Off-season is heaven if you are someone that likes to play golf 'til you drop. You could easily play three rounds in one day. With no foursomes coming up behind us, we lingered on the 15th tee to take in the spectacular ocean and island views. The course is an incredibly challenging stretch of undulating greens. Holes run right along the beach and you could easily drive your ball into the water. After a day of golf, we reserved the next day for lounging on the beach. The scene was reminiscent of a Corona beer commercial-sitting in an umbrella-covered chair, seabirds calling overhead, waves lapping and a clear view to the ocean. The water is a sparkling turquoise and emerald green with small breakers in the distance. There was a light ocean breeze and even a 12-foot catamaran with a striped sail crossing on the horizon to complete the idyllic view. One memorable outing for us was an evening visit to Pete's Bar, a simple beachfront structure with one side completely open to the ocean. Pete's serves excellent fish dishes and potent Blaster drinks. As the sun went down, a dozen hermit crabs with brilliant striped shells scrambled across the sandy floor. Before leaving Abaco, we took the golf cart on a last excursion around the Club. Beautiful blue green lizards scurried across our paths, and countless butterflies flitted about the cart as we toured among the well-tended gardens and waving trees. Yes, off-season in Abaco means open spaces, secluded beaches and huge helpings of peace and quiet. According to our local hosts, the seclusion makes it a favorite destination of more famous guests, such as Penelope Cruz, Cher, Brad Daugherty and others. The space, serenity and friendly staff of the Abaco Club made it a favorite of ours as well. Would I go back? As our new friend Archie would say, "I wouldn't say no!" Lauren Keyson is the Director of Communications for Ultimate Escapes, and a freelance journalist. She has written on travel, personal finance and the business of finance.